I’m really very proud of myself for this Christmas mantel decoration that I’ve done…and yes I know exactly how that sounds but I just can’t help myself. The mantel turned out so pretty for Christmas and it was extremely easy to do. I had planned on doing something extravagant this year but when I went to the crafts store I just wasn’t inspired by anything there. Reluctantly I went home thinking that my inspiration would probably come to me a day before guests would arrive, the whole performance under pressure kind of thing. Yet lo and behold, as we were taking the Christmas decorations out I came across three garlands that I’ve had that I’ve never really been satisfied with. I’ve used them inside and I’ve used them outside. I’ve used them high and I’ve used them low. But never have I ever used them this way I know! I already had these garlands and didn’t particularly care for them, in fact, I don’t know why I purchased them at all. They were very inexpensive, on sale, and I used a coupon on top of that. I think the most important thing in selecting the garlands is that they should all be very different! Below is an example of what my three garlands look like. I enlisted the help of my most meticulous assistant…my three year old. I chose the gold leaf garland and the berry garland to be the base. I gave the ends to my three year old to hold tightly while I twisted my ends around each other until the two garlands appeared to be only one. Then I chose the more sparse poinsettia garland as an accent to my new base and repeated the process but with fewer twists. Viola, it’s really that easy and inexpensive! 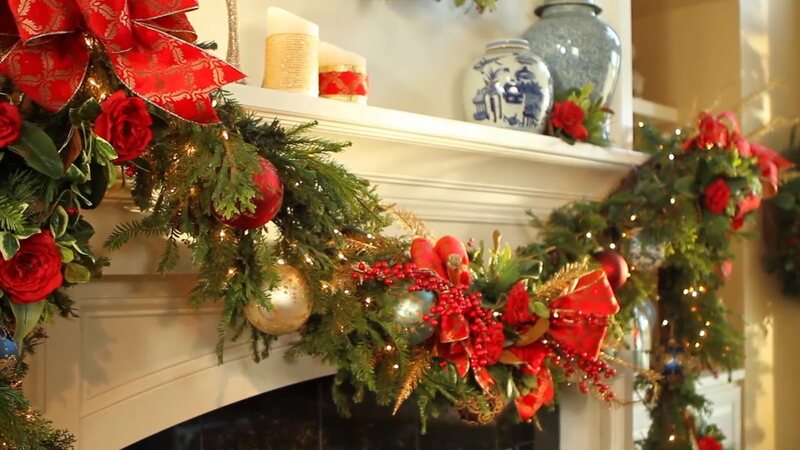 Anything can be worked into this Christmas mantel decoration. I used some of my Christmas décor mixed in with some of my everyday things. I love candles but I love remote controlled battery operated candles even more so you will see plenty of them used through out this arrangement. I placed things in front of and in back of the garland to give it a very dimensional feel. after this little experiment I’m ready to go buy more cheap ugly, I mean, inexpensive garlands and use them on my banisters and table setting. This was such a simple project that my little man got to help me with. I also learned a little something…not to covet those ridiculously expensive garlands that they sell in the crafts stores for $80 (the horror) because I can now make them myself. May His grace and goodness fill your hearts and bless you now and the whole year through.